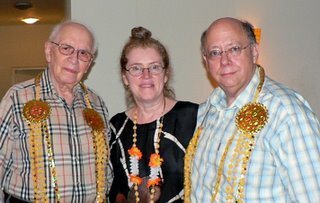 Thursday was a national holiday in India, so I took a long weekend and Marty, Roberta, and I headed to Kuala Lumpur, Malaysia, which is about a 4 hour flight from Chennai. 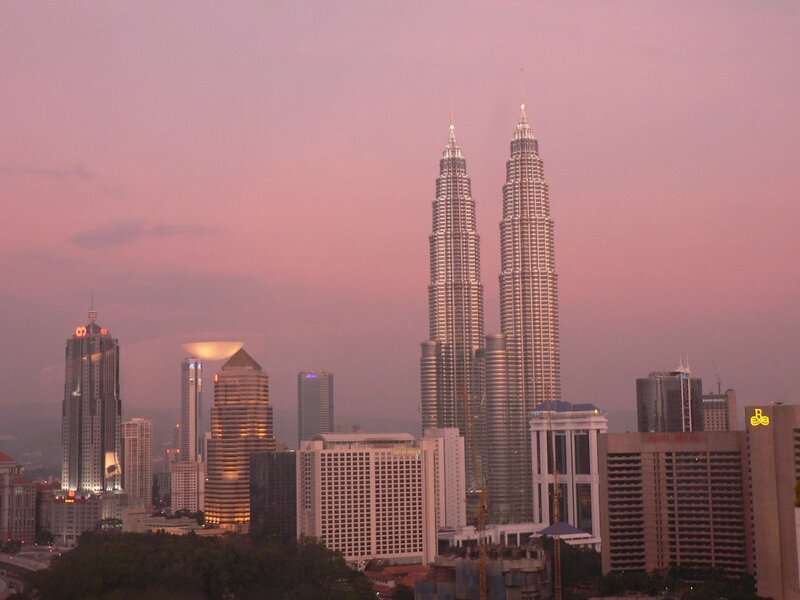 KL is a beautiful, modern city, perhaps a bit rougher, but less regulated and less expensive than Singapore. 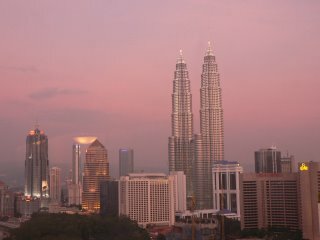 We stayed at the Sheraton Imperial not far from the Petronas Towers--the sunset view at the right is from our hotel window. 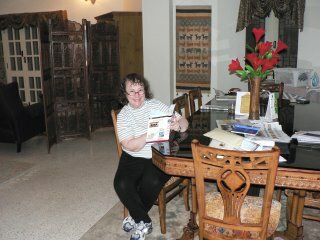 The hotel was one of the nicest, and most reasonably priced that we've stayed in anywhere, and the service was great. 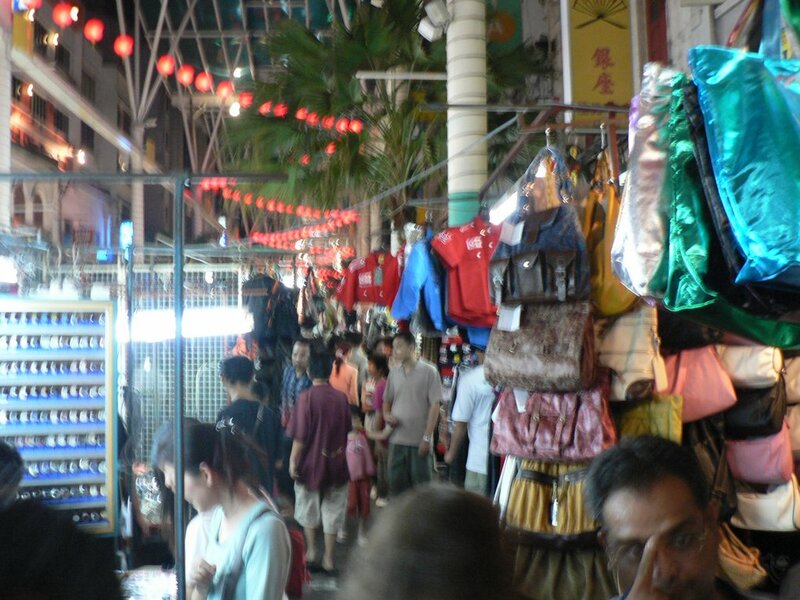 KL boasts a number of attractions within the city, such as the Chinese Market on Petaling Street, where you can buy fake Rolex watches and Gucci handbags, bootleg DVDs, and other treasures. We headed there after dinner one night---things get rocking only after about 9 p.m.---and pushed and shoved our way through narrow aisles along with thousands of other intrepid shoppers. We also took a tour out of the city to the firefly park, which is one of the most spectacular showings of nature I've seen in a long time....just after sunset, you take a silent, motorized boat out on the river, and soon every bush is alive with fireflies. They almost seem like an extension of the sky, forming mini constellations on the mangrove trees where they spend most of their time. Couldn't take a photograph of this, but along the way we stopped at a mountain vista and were entertained by a colony of monkeys, including the wise looking old guy below. Customer service has become one of my favorite spectator sports here. I have spent quite a few months observing the dynamics, but so far have refrained from comment, at least publicly. In addition to my own experiences, I have witnessed a number of Indians go absolutely apoplectic over service issues, especially in restaurants. My conclusion: it is no accident that India is the source of relaxation techniques such as yoga and deep breathing, because these are a necessary palliative to the daily frustrations associated with being a customer here. Manpower is not the issue. The photo above (which comes from a restaurant which actually has very good food and service) is typical of the resources devoted to serving the customer . (For an even more dramatic example, scroll down about halfway on the linked page for Prince Roy's shot of Lifestyle, a well known local department store. ) We also observed this at Apollo Hospital when Marty was there for his sciatica in June--a surfeit of sisters (as nurses are called here) was available round the clock to attend to every need. In fairness, Apollo is very well run and the care was outstanding. 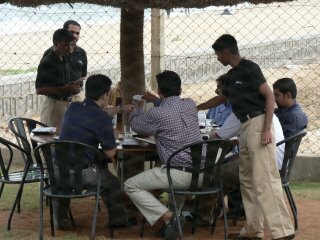 Waiters do not always write down your order, even when serving a large group. In such cases, you may get all or part of what you ordered--if it's your lucky day. There are multiple servers for different parts of the meal, compounding communication errors from #1. Many hotel restaurants have a ratio of staff to customers that appears close to 1:2. Not all of them look busy, but it is impossible to get eye contact if you need something (say, coffee). If you do succeed in getting the attention of the staff member nearest the coffee pot, he will not pick up the pot and serve you even if he is standing next to it. He will walk across the room and ask someone else to do it. Not all of your instructions (even if understood) are given to the cook---we saw this in person when I asked a waiter in Ooty for "two eggs, scrambled well", which was conveyed to the short order cook merely as "scrambled eggs." Self-service is not encouraged, even if it is quicker and more painless to do it yourself (see above--I was standing next to the short order cook). If you are observed reaching for the spoon in the rice bowl, someone will leap to your table to assist. If you had asked for water five minutes before and are still waiting for it, however, the same waiter will ask apologetically if you want more rice. Dishes are served in the order that the cook finished them. 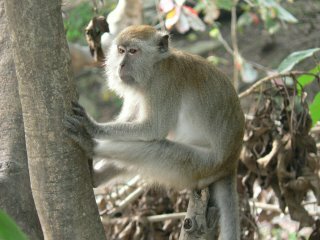 Quite often, some at a table will be done with their meal long before others are served. There is no point getting upset about this. If you insist on ordering a whole fish while everyone else has prawns, bring a good book to enjoy while your companions are eating. Even well-known Western dishes may contain surprises. Once, I ordered spaghetti with marinara sauce and it came laced with pickle relish. (This happens in Japan as well---I have an equally good story about French toast with tomatoes). In upscale establishments, you are likely to be asked, usually by a chirpy college fresher (as new college grads are called here) whether everything is all right and if you like the food and service. This may occur before you have had any food or service to comment on, and is the person's only obvious job. You should say yes, because if you say no, a flock of people will soon descend on your table to help. Unfortunately, most of the time they will make matters worse. If the restaurant does not have a dedicated person to ask about customer service (or even if they do) they will surely have the ubiquitous COMMENT CARD. The card will be given to you with the bill, although on occasion I have received them while I was still eating. I have yet to discover what happens to these cards, as service at the restaurants where I've filled them out hasn't noticeably changed---I think it would be a great story for an enterprising journalist to examine the feedback received and what restaurants do with it. This is one of the examples of "serendipity" in our posting here. We didn't even know about Roberta's Chennai connection until after we told her we were coming here. It turns out that she has had an invitation for several years to teach here, but never did so. Marty and I spent the weekend in Ooty, a hill station located about 3 hours from Coimbatore, south of Chennai but still in the state of Tamil Nadu. Despite the beauty of the place--depicted above--our journey seemed frought with misadventure, which has inclined me to consult an astrologist before we travel again! We took the sleeper train from Chennai to Coimbatore, sharing a compartment in second class with two Indian businessmen, one of whom snored loudly enough to be heard over the train noises (and louder than Marty!) We stayed on the train until Mettupalayam, a stop near Coimbatore which hooks up with the Nilgiri Mountain Railway, otherwise known as the toy train. 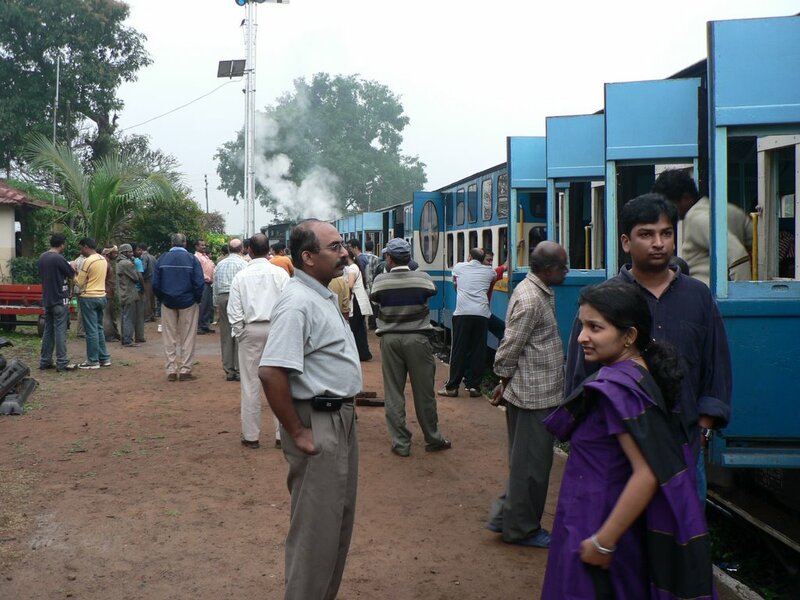 In colonial days, the Railway was used to transport tea from the Nilgiri hills for domestic and export consumption, but now it exists solely to ferry tourists to and from Ooty. 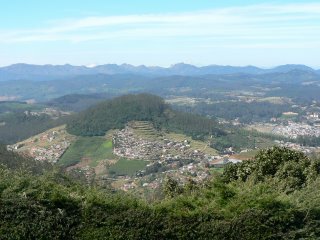 The train authorities had arrived at the stop, and said they had arranged a bus to transport us to Ooty, but it "would take some time." These are ominous words in India, and we and most other passengers took this to mean "every man for himself." Cabs were also organized for those who wished to pay themselves, so we and 4 other passengers--a middle aged Indian couple and two Dutch women--piled into an old Toyota Qualis with an enterprising driver who was asking 1200 rupees (about $30) for the ride, to be split among us. A few minutes later two other guys piled in and we were up to 8---cozy to say the least. The two guys, evidently known to the driver, got off in Conoor which is about 15 km from Ooty, and one of the Dutch women and I saw each of them peel off a 100 rupee note to pay the driver. Doing some quick figuring, the Dutch woman announced to the rest of us that our fare was now down to 170 rupees per person. When we got into Ooty--at roughly the same time the train would have arrived---the driver had other ideas. He pitched an absolute hissy fit at the notion that we were not each going to pay him 200 rupees. Shouting from all parties ensued, and the two Dutch women and Marty and I got out--the Indian couple refused to budge until he dropped them at their hotel 5 km from Ooty. Marty and I hopped into an autorickshaw (our first I might add), and went to our hotel for an additional 30 rupees, thereby bringing us back to the original 200 for the ride. 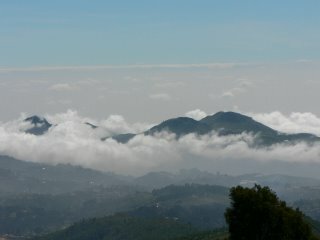 The road to Ooty contains fourteen hairpin turns and several thousand potholes, but had there been sufficient visibility, the scenery clearly would have made up for the rough ride. Unfortunately, both going and coming back, the weather did not cooperate. It began raining as soon as we arrived back at the head station for the toy train, and visibility was poor. On Saturday it cleared, but on Sunday when we returned to Coimbatore to fly back to Chennai, it was very foggy and at points visibility was down to less than 20 feet---a scary prospect considering the narrow roads and hairpin turns, not to mention aggressive drivers. 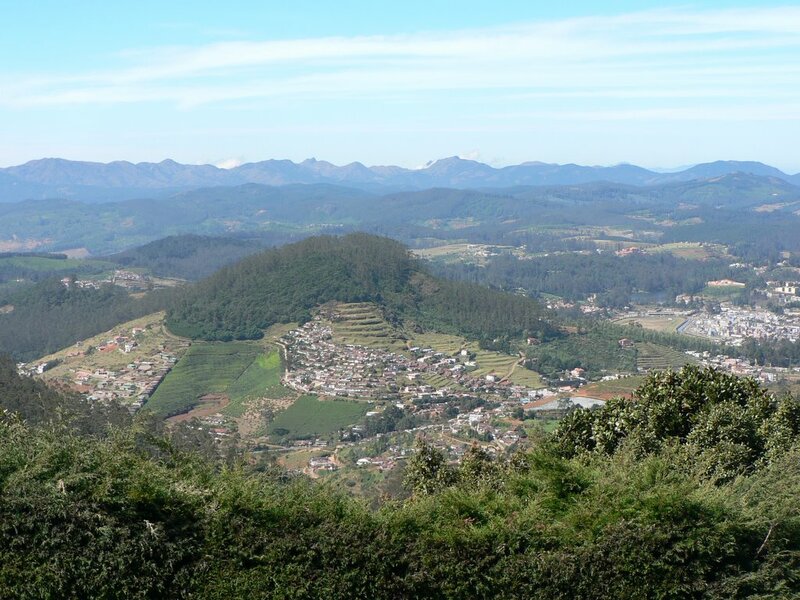 Still, while we were in Ooty, we got to do some sightseeing including a climb to Dodabetta Peak (below) and a visit to the local botanical gardens, as well as to a tea factory, which was more automated than the one we saw in Sri Lanka but equally fascinating. And there were some interesting crafts places as well. We stayed at the Holiday Inn Gem Park, which despite lackluster food (the Chinese place was okay, but the 24 hour cafe was marginal) had fabulous views. Time did not permit much more sightseeing than this, but Ooty is conveniently located to Bandipur National Park, a well known nature preserve about 80 km away. The park can also be reached from Mysore, so we may try to visit it from that direction --but checking for auspicious timing first! A Happy and Healthy New Year to all readers. It has been quite a year for our family, and we are looking forward to 2006 for another adventure filled year. Marty's sister Roberta arrives in just a few days to teach for three months at the Asian School of Journalism located here in Chennai, and our son Harry will come for three weeks in February. At that time, we are all planning to go up to Delhi and Agra and do the Taj Mahal and other North India sites. For New Year's Eve, Marty and I went next door to the Madras Club for their bash, but didn't make it to midnight. Probably we should have, because at the stroke of midnight there were fireworks at several places in the city including both the Madras Club and Madras Boat Club, which is also nearby. Above you can see Marty, Dad and I with garlands presented us by Leela. We both got a ton of SMS messages on our cell phones yesterday from well-wishers---New Year's is a big deal here. My Hindu employees say that they celebrate the holiday by going to temple, as the first day of the year is considered auspicious. More on Indian astrology in a later post. This week I paid a second visit, accompanied by a member of the Ford India Employees Association from the U.S who was visiting relatives for the holidays, to YRG Care (not all of their links work). YRG was founded by Dr. Suniti Solomon, who is India's foremost expert on HIV/AIDs. YRG does a tremendous amount of work in both prevention and awareness, as well as care for victims. They have an onsite clinic where testing and treatment is done, as well as emergency care (many hospitals will not admit known AIDS patients). Of special concern are housewives and widows, who are accounting for a rising number of cases. Domestic abuse is also very high in this population---housewives may be beaten for even suggesting the use of a condom. Widows are stigmatized by their families---their parents do not want to jeopardize the marriage of eligible daughters and their in-laws blame them for the disease. YRG helps by giving them a safe place to talk, by providing means to livelihood, and by treatment. What I like most about this organization is that it is very grassroots--everything they do comes from patient need and 100% of their charitable funding is used to the benefit of the population, as all their overhead is covered through research grants and other means. All meals for patients are supplied through a program called "365 friends" , where people give 1000 rupees on their birthday. A pharmacy on site was funded by the Elton John Foundation for $4000. It is possible to make a great difference here for relatively modest sums by U.S. standards, yet as much as the money it is establishing programs that are sustainable when the funding is through. They have invited me to attend one of the village community education sessions for housewives, and we are also planning some joint volunteer activities with our workforce in the new year.